Being logged out and losing everything I've written is getting really old! For the last two days I've spent most of my time within the 900 year old walls of Windsor Castle. No photography is allowed inside the buildings, so my opportunities are reather simplified. The staterooms are magnificient. It hard to believe you're truly standing there. My favorite one maybe "The Queen's Ball Room", as surprisingly small room compared to the others with three crystal chandeliers hanging rather low, and a row of windows looking out to the private section of the castle. In most of the other rooms I would hazard to guess that the ceilings are 50 ft. tall. Each room has it's own ornate furniture and paintings. The reception room truly stands out though. With white walls, gold leaf designs from floor to ceiling and huge mirrors you feel like you're standing in a see of white and gold. This room was maticulously restored after the devistating fire of 1992. One monarch who I have become increasingly familiar with is King George IV, son of the king who fought the Revolutionary War with He seems to have single handedly supplied at least one thrid of the collection on display from gold plated dishes to coronation robes to the portraits comissioned after the battle of Waterloo where Napoleon was defeated. 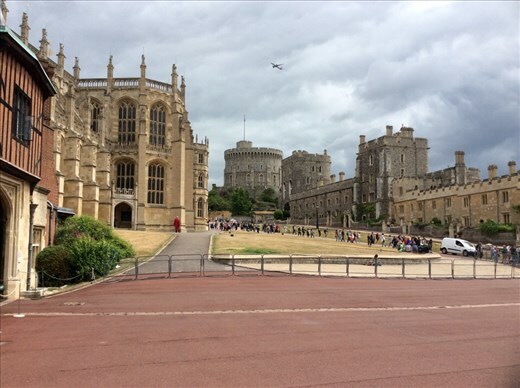 Another remarkable place to visit within Windsor Castle is St. George's Chapel with it's vaulted ceilings, centuries old stone walls, and stained glass windows. You can see the outside of it to the left in the picture above. Henry the 8th is burried here along with his 3rd wife, and mother and father. Queen Elizabeth's grandparents also lie here beneath their marble figures, and the most recent side chapel is dedicated to Queen Elizabeth's father, mother, and sister. Yesterday I stayed after most of the other tourists had left to listen to the evening song. Young boys have such beautiful voices! We sat in the choir where the Knights of the Garter are installed. Quite an amazing place to be with the giant pipe organ arching over the asile between the Nave and the Choir. This evening I opted for a walk in the grounds in front of the royal entrance to the castle called the Long Walk. It's a beautiful, wide entrance up to the castle lined with hundreds of ancient, or at least old, oak(?) trees. Tonight is my last night in my lovely air b&b before I head to Edinburgh. It's a typical old house with creaky floors, a small front garden and a somewhat bigger garden in the back. The stairs are surprsingly short in length and narrow, but it's all part of the charm, and so neat that people live here. The house was built in the late 1800s by a visionary named Bexley for the poorer people of the day. All the houses along the street have the same floor plan I believe, but they're all unique on the front, mostly due the their tiny front gardens. My hostess has been wonderful and I have gotten the feel of one English family here in this land across the sea. Really great pics! I'm so excited for you on this journey. Sounds great so far! Teagen, you have a future as a travel writer. Look forward to more posts! Glad you are enjoying your trip so far. Internet connections can be sketchy at some places. You might try writing everything in Pages, copying it and then pasting in your blog. If it lets you do that, you stand a better chance of getting it all in before it logs you out, plus you still have what you wrote. Sorry that you are doing drafts of your writings that keep disappearing. Now you know how those of us who went through college using typewriters felt when we were allowed only a maximum of 2 errors per page, otherwise we had to retype everything! Looking forward to whatever you write that makes it online. Much love to you from us people and animals! I didn't hear of any ghosts in the castle, though there are many tombs in the floor of the chapel. More than a few are actually right below your feet as you walk around. Enjoy this great opportunity! what an amazing trip, keep us posted.